When I finished my General Assembly course I treated myself to a copy of Universal Methods of Design which is a great book. 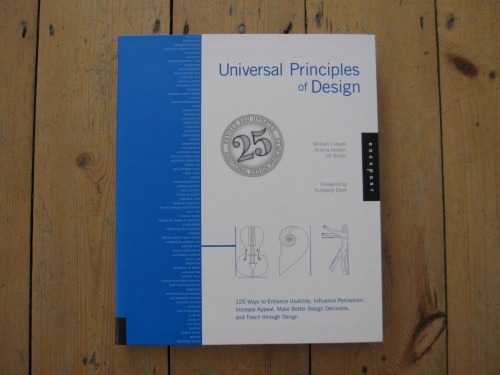 However recently I have been thinking that I could do with improving my knowledge of other design principles from across other design disciplines, which is where its sister book Universal Principles of Design by William Lidwell, Kritina Holden and Jill Butler comes in. With over 100 different principles there is something here for every situation, and with an index which splits them into sections which include ‘how to help people learn’ and ‘how can I make better design decisions’ they have made it reasonably easy to find the one which will help you. With the authors all coming from Texas it does have a certain American bias and in some examples it feels a little dated but that should not stop you from learning principles which could improve your designs. Set up in a similar manner to Universal Methods of Design, each principle has a two page spread with details of the principle on the left and supporting images on the right. I did find myself having to re-read some passages to really understand what they were trying to teach me, however there were a good handful of principles which I am aware of but did not know the official name for. I found it an interesting read and know it will make a good reference book for the future.